Sissy Northey is a rock star. She’s the beloved 12-year-old Chihuahua Pomeranian Mix of Jessica Northey. With a mom like Jessica, a top social media influencer in the country music sphere, Sissy has amassed a large fan following because of her playful mix of sassiness and sweetness. Jessica is the first to say of Sissy, “She’s got me wrapped around her paw.” And she has the entire team at PetCure Oncology at Arizona Veterinary Oncology wrapped around that little paw, too. Jessica rescued Sissy from terrible living conditions. She was covered in fleas and both eyes were infected with yellow discharge. She was only five- to six-weeks old. For Jessica, it was love at first sight, so she took Sissy home. With Jessica’s busy schedule traveling and interviewing country music stars, Sissy has always been by her side as her little shotgun rider. The special bond they have helped Jessica detect a lump on Sissy’s neck right away. It was a typical day in March when Jessica was cuddling with Sissy and felt a small lump. She did not hesitate to get the bump checked out. The first veterinarian who examined Sissy suspected the lump might be related to an abscess from a bad tooth. A teeth cleaning was scheduled for a month later, but during that time the lump continued to grow larger. Jessica knew in her gut that it wasn’t tooth-related, so Sissy underwent diagnostic testing that included an ultrasound, fine needle aspirate, and CT scan. These confirmed that Sissy had cancer, specifically thyroid carcinoma. Surgery was recommended as a treatment option. However, within the two weeks between the cancer diagnosis and the surgery appointment, Sissy’s tumor had doubled in size and grown into her jugular. The surgeon told an overwhelmed and scared Jessica that surgery was no longer an option. The hospital referred Jessica to PetCure Oncology at Arizona Veterinary Oncology (AVO) where a new treatment called stereotactic radiosurgery (SRS) was offered. For decades, SRS has been proven successful in treating humans with cancer, but it has recently become available to pets. It is a game-changing addition to established treatment options, providing newfound hope in the fight against pet cancer. SRS requires only 1-3 treatment sessions, an 80-95% reduction compared to the 15-21 treatments typical of conventional radiation therapy. That also means fewer anesthetic events for the pet and far fewer side effects. SRS delivers a high dose of radiation with sub-millimeter precision. This precision enables SRS to treat many tumors previously considered inoperable. 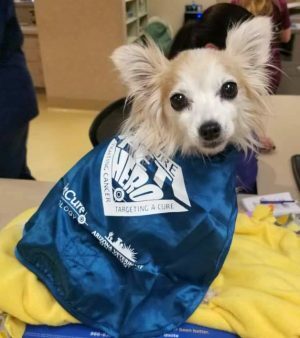 Fortunately, there was a last-minute cancelation and Jessica was able to make an appointment with Dr. Eric Boshoven, a board-certified veterinary radiation oncologist. On June 8, 2016, a CT scan was performed and a custom immobilizer was created for Sissy to keep her body still during treatment. She received three sessions of SRS from June 14–16. Although the drive from her home in Tucson to Phoenix for treatment meant four hours on the road each day, Jessica says it was well worth it. By the end of the last session, the large gumball-sized lump had decreased to the size of a peanut M&M. Her one-month checkup on July 29 showed the tumor was continuing to shrink. Jessica said Sissy experienced no side effects. Sissy ate well and was still a party animal. If your pet has been diagnosed with cancer or needs testing to confirm cancer, please contact a PetCure Oncology location near you. Our teams of specialists are ready to help you and your pet.